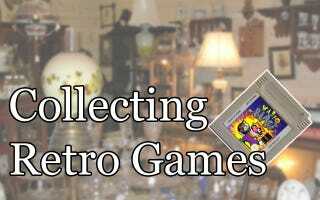 Collecting Retro Games are a series of informational articles teaching people about how to collect vintage games, take care of their collection and understand more about the hobby. In this article I’ll be covering the best places to buy vintage games and how to do it successfully. Now that you have a better idea of how the value of games work, you are probably wondering what’s the best way to actually start building your collection. Wanting something and getting something are two different animals, and if you’ve never really looked into buying older games, it can be a bit intimidating, especially if you happen to wander onto Amazon and see a game you want selling for 300 dollars or more. Fear not! There are actually lots of great places to get older games without breaking you budget or feeling like a fugitive with everyone trying to screw you. It just takes a little understanding of where to go, and what to do when you get there. Even a decade ago if you wanted to get older games, you would be forced to hunt down an older copy from an obsolete system or hope that a remake/reissue would be released. But today lots and lots of services offer older games for good value. This is wonderful especially if you are simply interested in playing older games rather than having a physical collection. GoG (Good Old Games) is the go-to service for older PC titles. Whether you are trying to capture your childhood memories of playing The Incredible Machine while in computer class or simply want to get an idea of what these old games are like, GoG has tons of sales like Steam to the point where many games are for free. The PSN Store, the Wii Virtual Console and Xbox arcade also offer older Sony, Microsoft and Nintedo titles that had been out of print for decades for a fraction of what their physical counterparts cost (I’m looking at you, Earthbound.) Myabadonware.com has made it their mission to make sure out of print games that studios aren’t interested in never get lost to history. With just a really big hard drive, you could easily create a massive collection of vintage games, and probably only invest a couple of hundred dollars to do so. But if you’re like me and have issues having access to digital games (I have internet problems...) or simply prefer a physical collection, you aren’t out of luck. Used game shops are actually a fantastic place to start putting your collection together. While many people have had bad experiences with used gaming due to a franchise that rhymes with Shame Drop, independently owned stores are actually great places to shop. While you probably won’t find Suikoden II for 5 bucks, the indy stores tend to sell most of their games very cheaply and will price by condition. And because the indy stores are labors of love rather than a cash grab, the workers at the store tend to be really experienced with gaming and will be happy to help you with any questions you might have. And when you become a steady customer, a lot of owners will give you discounts and even hold games you are looking for to the side when someone sells them a copy. However, always be wary if a worker is snide, or if they refuse to let you examine the merchandise before you buy it. If an employee refuses to let you examine the disc or cartridge and case for an item that isn’t still in shrink wrap, walk away. An honest store will always bend over backwards to make sure you are happy with your purchase. If you are unlucky and there are no independent stores in your area, your next stop is hoofing it. Garages sales, flea markets, thrift stores and craigslist are like the slot machines of used gaming shopping. Most of the time they don’t pay off, but when they do, they pay off big. Summer is the best season to check out garage sales because a lot of people move during the summer, and lots of kids are getting ready for college. And dear old mom thinking lil’ Jimmy doesn’t need his silly games now that he’s off to State University will often sell entire collections of games for a pittance. While you probably will only stumble across the AAA titles and sports games, you will sometimes find the old family SNES amongst the puzzle pieces and ceramic cats. Thrift stores often get donations from stores going out of business or getting rid of surplus merchandise, and occasionally you can even stumble on stuff still in shrink wrap. Pawn shops and Flea Markets are also good places, but the prices may be a bit higher since the people who run booths tend to be a lot more savvy then people just getting rid of their excess stuff. Because a lot of this stuff has no guarantee whatsoever, it’s super important that you examine your purchases carefully (is the right disc in the right case? What is the condition of the label? Is the manual here?) before buying them. And don’t forget to haggle. Especially if it’s towards the end of the day, people much rather cut into their profits than have to lug merchandise back to their car or house. Craiglist is also an option though personally I’ve never had any luck with it. It’s been my experience that people critically overvalue their stuff and aren’t willing to negotiate. If you live in the middle of nowhere, your only option for physical games may only be online. Looking at a lot of the auctions and listings, it seems like you have no option but to pay the big bucks to play those older games. This isn’t the case, since there are actually a lot of good tricks to not having to start auctioning organs to get what you are looking for. First off, with Amazon the price that shows up is usually the price for a new copy, which is still in shrink wrap. If that isn’t important to you, you can simply go to the used section. Read the descriptions carefully and check every couple of days. I’ve gotten lots of games because I caught a game someone had just listed for 10-15 dollars beneath the average used price, and I’ve bought games in ‘very-used, acceptable’ condition that turned out to actually be complete games with minor problems. Always read the seller details first to make sure you know exactly what you are getting. If it doesn’t say it comes with everything, and that’s what you want, feel free to skip it because you can’t assume it does come with everything. Ebay is a little trickier because it tends to be a hotbed of cheats, bootleg copies and overpricing. Like Amazon, your best bet is to check regularly, gauge the seller (sometimes sellers get bad reviews for stupid things like not liking the game or not liking the stamps. I’ve seen it all). Collecting is a long game, and if you don’t have the patience to watch a few titles you want go because they got priced outside your range, you’re going to end up paying for it. People often forget this one but a good way to get a game you want is to trade with someone for something they want. While a lot of collectors have the ‘my preciooouussss’ mindset when it comes to their collections, the people who collect to play are happy to see games they don’t particularly care for end up with someone who does want them in exchange for something they like better. I’ve gotten games this way as well. Before the big price drop on FFVII from it going to the PSN, I had a really hard time finding a copy that didn’t cost more than my college tuition. Luckily, a friend of mine had just gotten rid of his Playstation and knew how badly I wanted to play, so he sold me his copy for 20 bucks. And thus I was able to watch the protagonist cross-dress like God intended. When it comes to collecting and places to buy, the name of the game is patience and hard work. If you wait for the sales, look in the stores and skulk the secondary markets, it is possible to put together a nice collection without having to break the bank.